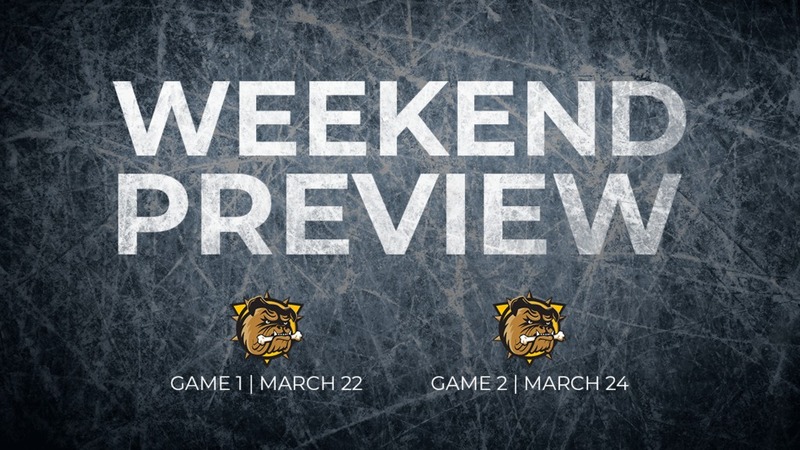 After closing out the regular season with a win against the Kingston Frontenacs, the Ottawa 67’s will finally open their first-round OHL playoff series against the Hamilton Bulldogs on Friday night. Following a record-breaking season under Andre Tourigny’s coaching leadership, in which the 67’s finished with a regular season record 106 points and 50 wins, Ottawa enters the post-season as the Eastern Conference’s top seed. 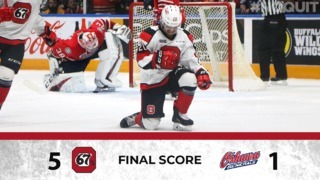 The 67’s are looking forward to a raucous crowd to help push them to victory early in this series, with the players getting an extra momentum boost thanks to some of the year’s biggest crowds on hand to watch the final regular season games. 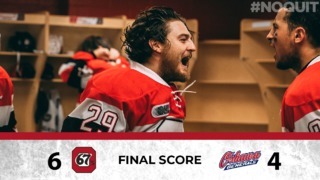 No question, there is a lot to get excited about with this year’s edition of the 67’s: while the club has shined offensively thanks to 59 goals from overager and 29 courtesy of rookie Marco Rossi, the 67’s have received offensive and defensive contributions from throughout the lineup. A blueline anchored by the likes of Noel Hoefenmayer and Kevin Bahl is a force to be reckoned with, while Ottawa boasts arguably the strongest goaltending tandem in the league with Mikey DiPietro and Cedrick Andree. This will be the second time in as many years that the 67’s and Bulldogs have met in the first round of the playoffs, with top see Hamilton getting the best of eighth-seed Ottawa last year. Following Game 1 on Friday, the 67’s will be back on the ice at The Arena at TD Place for Game 2 at 2 p.m.
Can’t make it to the games? You can catch all the action on Rogers Ottawa, TSN 1200 or OHL Live. Its déjà vu for the Hamilton Bulldogs and the Ottawa 67’s as they face off again this year in the first round of the playoffs. However, this season, Ottawa clinched the Hamilton Spectator trophy, while the Bulldogs finished in eighth. 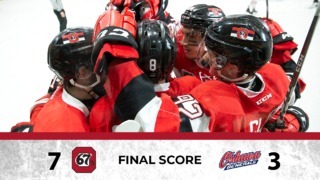 The 67’s won all five games this season against Hamilton, recording an 8-1 win in their first matchup. Last season, Hamilton finished in first with 93 points while the 67’s placed eighth with 69 points with the Bulldogs winning the OHL Championship and placing third in the 2018 Memorial Cup. This season, Hamilton finished in eighth place with only 63 points while the 67’s finished on top with 106 points. Bulldogs’ left winger, Arthur Kaliyev, finished the regular season off with 102 points, seven points behind 67’s star forward Tye Felhaber, who was just one goal short of 60 this season. Kaliyev finished with 51 goals and 51 assists and ranks second for power play goals, netting 20. Hamilton’s starting goalie, Zachary Roy, was not in nets for their last game, but he played for the majority of this season and finished with a 0.884% save average and a 3.59 GAA this season.